Sign-ups closed for Meeple League's 1st Online Event! Here at the Meeple League our primary mission is to improve the quality of board game tournament offerings. We are delighted to announce that one of the ways we will do that is by offering our own online events! Just like “live” events, we will use a standardized format so you’ll know what to expect whenever you sign up, but the details for online events will be different from the typical tournaments you might have experienced at a convention. This article will walk you through everything you can expect from our League format, plus – most importantly – tell you how you can sign up for our first supported game: Thurn & Taxis! Our online events will be structured as ongoing leagues, and not as one-shot tournaments. When you sign up you will be placed in a league along with 6 other gamers, and you will be placed into 4 total games (with each other member of your division appearing in 2 of them). All the games will be played “asynchronously” through a specified website, which means players will each check in to see if it’s their turn several times a day at their convenience, and the games will play out over the course of several weeks. Once all the games are done, we use a point system to see who won each league (10 points for 1st, 6 for 2nd, 3 for 3rd, and 1 point for finishing last). The leagues themselves are divided into divisions and whenever you win a league, you get promoted up to a tougher (but more prestigious) division. Meanwhile, if you finish in the bottom 2 of your league, you get demoted into an easier division for the next season. We’ll keep track of lifetime standings so everyone can see how they measure up, and we’ll also be prominently displaying the names of everyone who wins division one. Click to see detailed rules. Fans of Terra Mystica may recognize this as the same basic format being used on http://tmtour.org/#/ to govern tournaments run using the online implementation at http://terra.snellman.net. We think this system will work well for lots of other games, too. Note that in order to seed players for the very first season, we’ll be using the lifetime laurel counts from the Boardgame Players Association – aka, the folks who run the World Boardgaming Championship . You can check your laurels for the game on the T&T Event History Page. 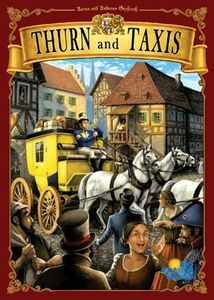 Thurn & Taxis is a nice light Euro-game that has been very popular on the tournament circuit ever since it won the Spiel des Jahres in 2006. It’s actually one of the few games at the World Boardgaming Championships that’s big enough to require a quarter-final round. Our Thurn & Taxis League will use the online implementation at www.yucata.de. We will use the original version of the game – no expansion content, and no special options. Games are scheduled to start in late January and you’ll receive a schedule in your email once the pairings are ready. If you do sign up, you are committing to checking the website a couple of times on most days (it’s OK if something comes up every once in a while, or if you’re out of town for a weekend (for example), but in general we’re hoping game lengths will be measured in weeks not months. You must be 13 or older to participate. If you are 13 to 17 years old, you must have parent/guardian approval. You must have an account on yucate.de to play. If you have laurels listed on the BPA website that will be used to match players in leagues. You don’t have to join the Meeple League to play, but we would really like you to join us. Since the tournament is held at yucata.de, the yucata Trueskill values should also be used for ranking players, especially when no BPA ranking is available for them. That is exactly what we’re going to do! Hi all. I signed up to play, but don’t see I was included in any of the divisions. How can I get included?